Bet poor Luigi feels a bit left out. Like an end of level boss that refuses to be beaten, the DS Lite is still available brand new in the US, where its recommended retail price is about to drop to $99.99. The best-selling console will see its cost cut this Sunday, 5th June, just two days before Nintendo's E3 press conference. Mario vs. Donkey Kong: Mini-Land Mayhem! : more than 1.01 million units. All this Mario-related action no doubt acts as a prelude to the grand unveiling of Super Mario 3DS on Tuesday at E3. Will that game also come in a red box? Keep coming to Nintendo Life for all your box colour knowledge needs. REDMOND, Wash.--(BUSINESS WIRE)-- The portable Nintendo DS™ Lite system is getting a new suggested retail price. Effective June 5, the system will be available at a suggested retail price of just $99.99 in the United States. The Nintendo DS family has become the best-selling video game system in history. More than 48.9 million systems in the Nintendo DS family have sold in the United States alone. 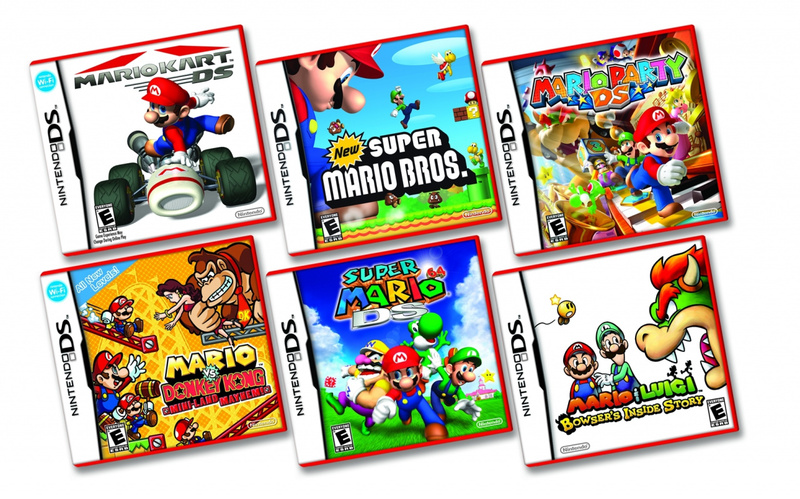 Also in June, six Mario™ games for Nintendo DS will receive new red packaging, making it easier than ever for consumers to identify these hit titles in stores. Mario is one of the most beloved video game characters and the top video game franchise of all time. Thirty-one Mario games have topped sales of more than 1 million units since 1995, more than any other franchise. Through the end of March 2011, more than 262 million games in the core Super Mario™ series have sold worldwide. Damn. I'm really, really tempted to pick up a new DS lite. My hinge is cracked and DS games are awful on the 3DS... hmm. Wait, so, are they just making the boxes red, or will this be similar to the Wii Selects discount line? Though I dont mind my 3DS for DS games. @Zeeroid Same price, new colour. I believe the question is "Will the said games go down on the price?" I have 2/3 of those games, don't want Mini Mario, but I want Bowser Inside Story, but theres 3 3ds games, so i'm thinking of getting those first. @James Rats! I'd been hoping to get Bowser's Inside Story at a bargain price for months. No price drop? That's weird. You'd think they'd be trying tO start clearing stock, but I guess sales are still too good. Ugh, what about the DSi? Finnaly gonna pick up "Mario & Luigi: Bowser’s Inside Story" then. Would've been nicer if it was a 3DS price drop. Wait I thought Nintendo stopped production of the DS Lite. Does this mean they are selling all the leftovers of the DS Lite or did they reconsider re-selling some again? They managed to keep it at $129.99 for five years! That's impressive. $99.99 is a great deal. The game library is enormous, so the DS Lite still has a lot of fun to offer. About 6 months ago, my DS Lite died after 4 years of gaming. I wanted to replace it, but the DSi just seemed to expensive for the features it offered. Thanks to Black Friday sales, I wound up finding a DS Lite new from amazon for $89.99. The cheapest DSi sale was $129.99, so there was no contest! I wasn't going to spend an extra $40 just to lose GBA support, get a camera that I had no interest in, and gain access to an online shop where I would spend more money. DS games are crazy cheap, too. You can find Elite Beat Agents new for $9.99, FF4 for $16.99, Chrono Trigger for $16.99, etc. I'm sure you can do even better if you look for used games or old GBA cartridges. As far as I'm concerned, the DS Lite is still the smartest purchase of a video game handheld. For a family with 2 kids, you can now buy two DS Lites and a couple of multiplayer games for the price of a 3DS with no games! Or for an individual gamer, you can buy a DS Lite with enough games to last 1-2 years for the price of a 3DS with no games. Long live the DS Lite! I really want to get Mario Party DS. If only it was $20 and I'd be more than willing to purchase it. i had to sell my old ds lite to get my dsi on launch day... i may pick one of these up just because i want to have all versions off the ds so i can put them next to each other on a shelf one day when i'm old. all i need is a ds lite and an dsi XL. This would be even better if it got a price drop, then I would totally buy Miniland Mayhem. I'll get Mario vs. Donkey Kong: Mini-Land Mayhem later . . . much, much later. I might get Mario vs Donkey Kong. I want just one of the red packages, and it's the only game out of those that I don't have. Also, are the prices on the games being cut or are they just changing the package? I got a GB SP and a Micro for GB and GBA games and a DSi (upgraded from a Lite, which was upgraded from a Phat) for my DS gaming. At $99 the last remaining stock of DS Lite will be gone before the end of september. @Mikau94: Currently playing Mini Land Mayhem and it's definitely worth the day 1 price (which I paid) for the included levels and all the ones you can download. I'm almost surprised that they still make the DS Lite with the 2 version of the DSi and the 3DS on the market as well. Maybe this is a way to clear off the rest of the old stock? The red boxes look pretty cool. My brother just picked up Bowser's Inside Story as a present for for my son's 5th birthday. I wonder if he'll be able to swap it for a red case one since it hasn't been opened yet. "Keep coming to Nintendo Life for all your box colour knowledge needs." Y'know, when Sony or Microsoft change the color of their video game packaging it is to indicate a drop in price but nope, not Nintendo. Hmmmm Now I am half tempted to upgrade my Original DS to a DSlite. Plus I guess now would be a good time to pick up some of those games that I missed the first time around like Bowsers Inside Story and Mario Kart DS. I kind of want Super Mario 64 DS now since I don't have my Wii anymore and I have a 3DS, so the analog stick should be better. Attention 3DS owners! Pick up Super Mario 64 DS! I hear that it feels good with the Circle Pad! Now that it's in red packaging, it should be even easier to notice! I just wish those Mario games were reduced in price, like the DS Lite. I own them all, except for Mario vs. Donkey Kong: Mini-Land Mayhem! Pointless in changing the color of the box if they aren't dropping the price of games. And why the heck is SM64DS still $35? Boy thats a bummer I thought the changing of the color was cause it was a price drop. So than whats the point of changing the box color if its not for a price drop? Time to get SM64 DS. Damn. The price is still very high though. Now it's really temping to get a new DS lite just Pix said, but I don't mind DS games on my 3DS any more and I have a DSi. Oh well if I have a spare 100 lying around I might pick up a spare black one along with Super Mario 64. "We've sold over nine million copies of this game, but heck, we'll still charge $35 for it...BECAUSE WE CAN!" Man, that's bullcrap. Also bullcrap is the lack of Mario & Luigi: Partners in Time on this list. Hopefully they'll announce a price cut, but I'll probably still get Mario vs. DK because I haven't already. Might as well wait and get the red case just to be different. I'm surprised Princess Peach wasn't in there. Wasn't that game more badly in need of a reprint? Already have NSMBWii Mario Kart DS. Bowsers Inside Story looks pretty rad, but I could care less for RPG's. While Mario Party DS was awfuly boring and funk that shotty looking version of Mario 64 that makes use of the D-Pad, i still never bothered with that one. BUT I would love to get Mini Land Mayhem. But wait a sec, has the price been dropped for these titles? Looks like they want to get rid of the stock, as the DS Lite has been discontinued. @ 37 Yeah I really didn't like that Super Mario 64 was remade for a system with the d-pad I wish they waited and released it with the 3ds since it has a control stick. Crud, my DSi still works. Oh well. Tempting but...I've got too many gadgets. I would have gone for Partners in Time rather than March of the Minis. D: But I don't own any of these so I will be happy to collect them all... for a reduced price. Just bought a DSi a few weeks ago for $110, and another a few months before for that for $110 (both at Target) so for the extra $10 I'm good. Couldn't believe the Lite was still the same price as the PSP until yesterday. Hardware wise that just seemed unrealistic. 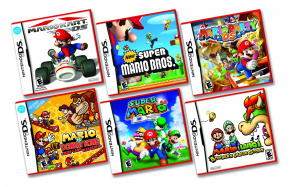 The only game of the six I'd be getting would be NSMB since in my opinion, the other five were not as enjoyable.